These close harmony arrangements in the barbershop style are suitable for both beginning and experienced male quartets. Twenty inspirational hymns arranged for male quartets and choruses. A collection of barbershop standards by Val Hicks, Joe Liles, Greg Lyne and many others. This volume of arrangements has been compiled by the Society as an introduction to the joys of barbershop singing. The arrangements are simple but solid harmonizations of familiar and beloved melodies which are especially adaptable to the barbershop style. Although prepared primarily for beginning quartets and choruses, these songs will, with the use of imaginative and appropiate interpretation. create an effective and enjoyable presentation for the experienced groups as well. 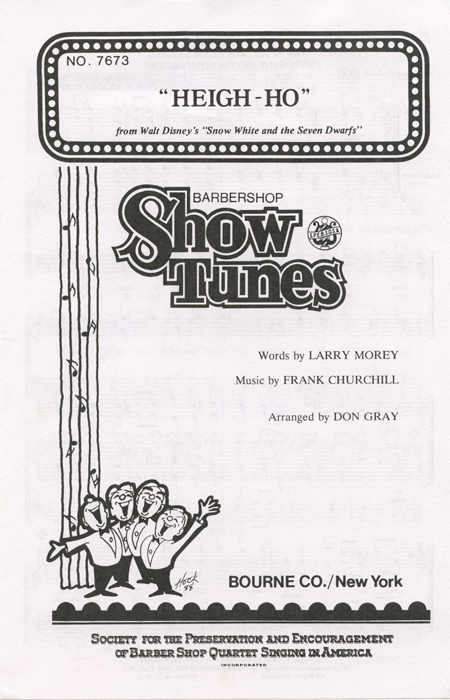 The Barber Pole Cat Program was created many years ago and features popular Barbershop songs arranged and voiced so ALL singers can learn and participate. For decades these have been the standard arrangements where singers can meet at conventions and sing together having never met before. Anniversary Collection of over 50 barbershop classics - every barbershopper should own this one! Everyone will have a good time with this feel-good close-harmony arrangement! A fantastic introduction to Barbershop music! Four copies of the sheet music arrangement plus a CD featuring the full performance plus part-predominant tracks (Tenor, Lead, Baritone, Bass), sung with lyrics. The rousing chorus from Les Miserables will be a powerful closer for any performance. Your men's chorus will bring down the house! Four copies of the sheet music arrangement plus a CD featuring the full performance plus part-predominant tracks (Tenor, Lead, Baritone, Bass), sung with lyrics. Opening with a very free close harmony verse, this favorite song moves into an easy swing that will show your vocalists at their best! Four copies of the sheet music arrangement plus a CD featuring the full performance plus part-predominant tracks (Tenor, Lead, Baritone, Bass), sung with lyrics. Your singers and audiences will love this barbershop arrangement with a bit of doo-wop flair! The #1 pop hit of 1980 by Queen will be a knock-out in performance! From Where's Charley by Broadway legend Frank Loesser comes the tongue-in-cheek salute to marching bands! You can hear the rat-a-tat of the drums, you'll chuckle at the song's humor and you will bring down the house with the big ending! Energize your men's chorus and have fun with some Barbershop harmony! Opening with a gradually building "doo-wah" introduction, invite your audience to clap along while the lead sings the melody: "Hey little baby o' mine, tell me that the sun don't shine, I love you and you love me, that's the way it oughta be." With its detailed performance notes and fun "tags" this collection of beginning barbershop material is perfect for young men learning to sing in close harmony. The CD features part-predominant tracks, sung with lyrics. This 1950s doo-wop classic will add a touch of nostalgia to your concert! Smooth a cappella harmonies will delight your audience and the arrangement is super fun to rehearse and perform. Four copies of the sheet music arrangement plus a CD featuring the full performance plus part-predominant tracks (Tenor, Lead, Baritone, Bass), sung with lyrics. A close relationship between the barbershop and gospel quartet styles has been apparent for many years and this arrangement is a fine example. This particular arrangement was made popular by the Vagabonds quartet, 1976 silver medalists. Excellent performance notes included. Close Harmony For Men : What'll I Do? Ed Waesche, one of the Society's most popular and prolific arrangers, borrowed the tag from Renee Craig's arrangement of this classic song. There is probably no greater influence on the world of barbershop music and performance than the inimitable Renee Craig and this is a great example. Measures 26-26 as sung by Platinuum are a bit challenging for the bass, so their version is placed at the end of the arrangement as an option. "Hello Mary Lou" was written by Gene Pitney, and performed by Ricky Nelson in 1961. It has been recorded by many groups including Led Zeppelin and Queen. The style of this arrangement is similar to the best-known version by Ricky Nelson. The song should have a moderate duple meter feeling, like an easy country two-step. On the second verse, be sure to feature the lead voice in the musical texture. At measure 41 allow the tenor to join the lead feature. Keep the tempo steady all the way through to the tag, but feel free to hod the last chord as long as you want for a strong ending. 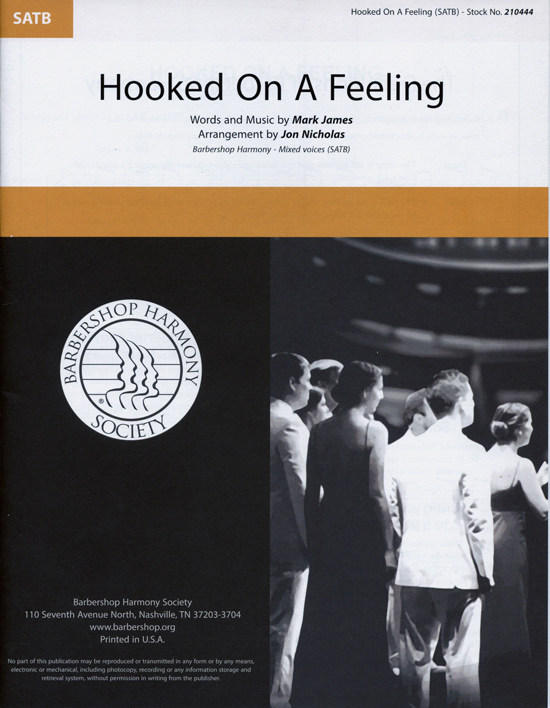 Four copies of the sheet music arrangement plus a CD featuring the full performance plus part-predominant tracks (Tenor, Lead, Baritone, Bass), sung with lyrics. "In The Good Old Summertime" and "Take Me Out to the Ballgame" were both published in the eary 1990's. These songs are stil loved and recognized across America today, and "Take Me Out to the Ballgame" is considered the unofficial national anthem of the sport of baseball. Be sure to sing each song fast enough to create a "waltz feel" in 3/4 time. The audience should feel and understand, through your energetic performance, teh fun and excitement of a baseball game on a beautiful summer day. The CD features part-predominant tracks, sung with lyrics. Four copies of the sheet music arrangement plus a CD featuring the full performance plus part-predominant tracks (Tenor, Lead, Baritone, Bass), sung with lyrics. In 1964 the legendary pop group The Drifters recorded Artie Resnick and Kenny Young's "Under the Boardwalk." It has become one of the most recognized popular songs ever recorded. Have fun singing this audience pleaser by making up a visual plan for your performance. For example, you could wear colorful shirts and sunglasses, or create simple choreography to showcase the tenors and basses when they sing the melody on the refrain. Any visual references in the text could be accompanied by appropriate gestures that entertain your listeners. Allow the syncopated rhythms to sound free and agile while maintaining a god connected flow to the singing. Four copies of the sheet music arrangement plus a CD featuring the full performance plus part-predominant tracks (Tenor, Lead, Baritone, Bass), sung with lyrics. "This Little Light of Mine" and "Do, Lord, Remember Me" are two songs from the African-American spiritual tradition. You can sing the entire song at a moderate tempo, or start a bit slower (as indicated) and increase the tempo with each new section of the music. In either case, the dynamics and intensity should increase throughout the performance of the song. Four copies of the sheet music arrangement plus a CD featuring the full performance plus part-predominant tracks (Tenor, Lead, Baritone, Bass), sung with lyrics. "Coney Island Baby" and "We All Fall" were first conbined as a medley by Les Applegate in 1924 for the musical comedy "No, No, Nanette" This song has traditionally been started with a "bell chord" by having the bass sing and hold is first note on the word "oh," followed quickly by the addition of the baritone note, then the lead, and finally the tenor. Continue to "goodbye" without a breath. Most importantly, entertain your audience and have fun while singing this classic barbershop audience pleaser. 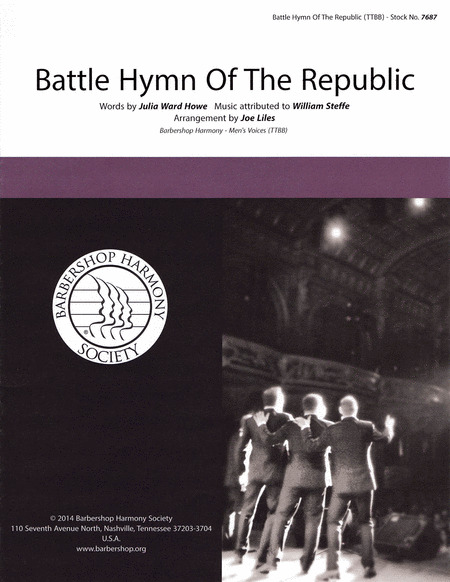 Four copies of the sheet music arrangement plus a CD featuring the full performance plus part-predominant tracks (Tenor, Lead, Baritone, Bass), sung with lyrics. "Sound Celebration" was written by composer and arranger Tom Gentry in 1996 for a women's barbershop chorus from Wisconsin. Tom fell in love with barbershop music at age 16 when he sang in his high school's production of The Music Man, and Barbershop has been a big part of his life ever since. Sing the introduction with a full and energizd sound, taking time to enjoy the chords in measure 3. In measures 13-20 each section has a melodic solo. Be sure to bring out these melodies so your audience can hear them clearly. Four copies of the sheet music arrangement plus a CD featuring the full performance plus part-predominant tracks (Tenor, Lead, Baritone, Bass), sung with lyrics. 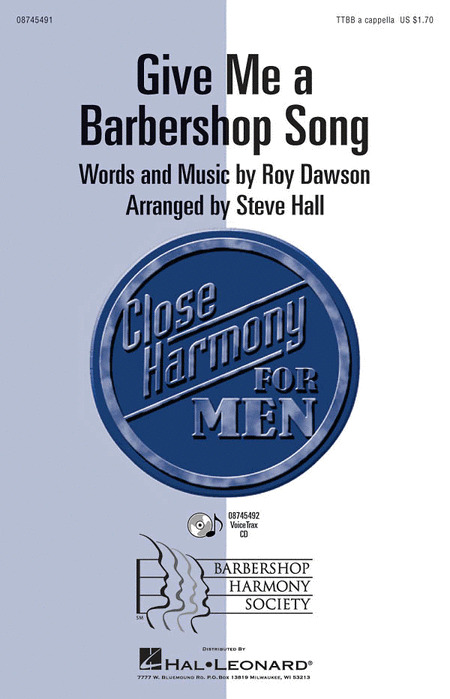 "Give Me a Barbershop Song" was written by Roy Dawson, a member of the British Association of Barbershop Singers (BABS). The verse should be sung in a free, almost conversational, style. Work to establish three four-bar phrases, even if you choose to lift or breathe after every two measures. The chorus should have a light swing feel, like an old soft shoe number. Energize the singing all the way through the end of the song. Pay special attention to the beathing suggestions in measures 35-39 and 67-71; this overlapping scheme helps create a continuous sound and flow characteristic of the barbershop style. As always, have fun entertaining your audience! Four copies of the sheet music arrangement plus a CD featuring the full performance plus part-predominant tracks (Tenor, Lead, Baritone, Bass), sung with lyrics. "The Star Spangled Banner" and "America the Beautiful" are two of the best-known (and most-loved) songs in America. You will note that the melody of the Banner is passed between the lead and bass sections to preserve the close harmony voicing in this rangy melody. Work to achieve choral balance such that the audience can hear and follow the melody. in the overlay to America the Beautiful, have a small group, or even the audence, sing the unison melody first. Next, have a chorus or quartet sing the overlay section alone. last time through, combine the two parts. Feel free to improvise harmonies in the tag section! Four copies of the sheet music arrangement plus a CD featuring the full performance plus part-predominant tracks (Tenor, Lead, Baritone, Bass), sung with lyrics. 'Silhouettes' was a hit single by the Rays in 1957. Tom Gentry's arrangement is an audience pleaser that can incorporate visual enhancements such as sunglasses, leather jackets, and choreography. Be sure to let the 'doo-wop' swing feeling be natural and unrushed, with hte melody always prominent in the texture. Keep the diction clear and precise so that the audience can understand the humor of the story on the text 'you're on the wrong block.' Feel free to experiment with the smoothness of the bass line by having the section sing on an open vowel such as 'du' rather than 'dm.' Four copies of the sheet music arrangement plus a CD featuring the full performance plus part-predominant tracks (Tenor, Lead, Baritone, Bass), sung with lyrics. Composer Joe Liles has been an employee of the Barbershop Harmony Society since 1975 and has served as the Society's Executive Director, Director of Music Education and Services, and as the Music Publications Editor. He is also a composer and arranger of music for religious and popular groups, as well as barbershop quartets and choruses. His catalog contains hundreds of original compositions and arrangements. 'Harmony Leads the Way' should be sung legato, but with strong energy and clear diction. Allow the syncopated rhythms to unify into a steady meter of two without too much accent in the line. This piece would make a great opener or closer. Four copies of the sheet music arrangement plus a CD featuring the full performance plus part-predominant tracks (Tenor, Lead, Baritone, Bass), sung with lyrics. Billy Joel is an American pop music icon who has written and recorded Top ten hits over three separate decades. He has won six Grammy awards for his music, and has sold over 100 million records. Because the melody of 'The Longest Time' has a wide range, be sure to keep the singing light, supported, and free in the upper ranges. Feel free to add finger snaps on the off beats to keep the flow and feel of the original recording. The background 'oo' and 'ah' parts should support the melody with legato articulation. Four copies of the sheet music arrangement plus a CD featuring the full performance plus part-predominant tracks (Tenor, Lead, Baritone, Bass), sung with lyrics. A collection of standards and originals for quartets and chorus by Rudy Hart, founder of this highly acclaimed chorus. The first collection to be published of the highly accessible and rewarding arrangements of Rudy Hart. Designed to expose students to the joys of singing a cappella, natural harmony. Songs can be sung in two or three parts. The original Barberpole Cat Program launced bin 1971 became standard repertoire for barbershoppers around the world. The Barberpole Cat Songbook Volume 2 is designed to bridge the gap between polecat songs and music at a difficulty level that many groups sing. It is music for when you want to sing something everybody knows but can't decide what to learn. Raise the roof with the vibrant close harmonies found in this fun collection of spiritual favorites! A close relationship between the barbershop and gospel quartet styles has been apparent for many years and these arrangement are fine examples. 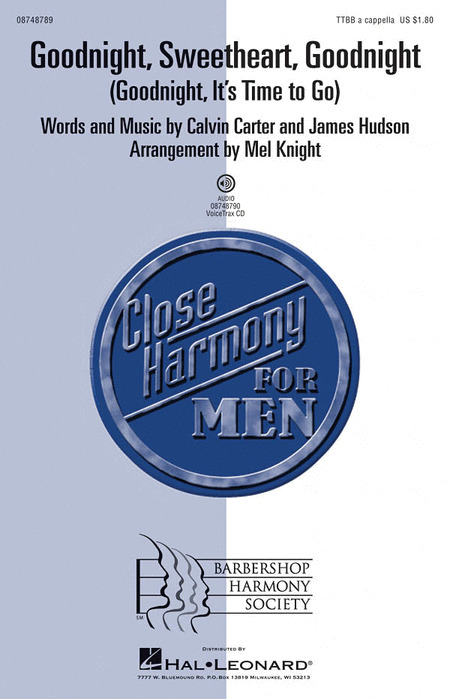 Spirituals sung in the barbershop style can be very moving for both singers and audiences alike and this collection is highly recommended. Scott Kitzmiller's rendition of the jazz standard was arranged for Realtime, the 2005 International Quartet Champion. Realtime added it to their Four Brothers album. Filled with fun syncopations and a catchy lyric, this is sure to be the perfect swing song in any repertoire. One of the greatest spirituals ever written arranged by one the barbershop's greatest arrangers. Simply wonderful. This original song and arrangement by Steve Delehanty is a wonderful celebration of married life. Gentlemen singers, you will be in the good graces of your better-half for a very long time after singing them this touching ballad! A signature Van Morrison hit from the 1960s, Brown Eyed Girl has been covered by countless artists such as Jimmy Buffett, U2, Adele and Bob Dylan, and was inducted into the Grammy Hall of Fame. This classic a cappella barbershop arrangement features a steady tempo, plenty of energy and enthusiasm, and a whole lot of fun! Long associated with barbershop quartets, this classic arrangement is a perfect starting point for groups new to the style. Available separately: TTBB a cappella and VoiceTrax CD. Performance Time: Approx: 2:30. Tom Gentry : Do You Hear the People Sing? The rousing chorus from Les Misérables will be a powerful closer for any performance. Your men's chorus will bring down the house! Drivin' Me Crazy was written in 1989 and originally performed by Arcade, the 1992 Mid-Atlantic champion. Though originally intended to be an afterglow tune, it has since turned out to be an exciting show opener or closer. The tune has been recorded by International champs OC Times and Keepsake. A strong performance of this arrangement requires smooth singing accompanied by fine attention to the rhythmic theme that drives the song. There isn't a better way to make my day ... than a good old barbershop song. Invite your audience to sing along with this light-swing original. Available separately: TTBB a cappella and VoiceTrax CD. Performance Time: Approx. 3:45. Featured in the movie Despicable Me 2 this song catapulted to number one in 2013 with its irresistible melody and hook. Sing the song at a brisk, even tempo, using the syncopation to drive from start to finish. Here is the quintessential barbershop song! This favorite SPEBSQSA arrangement will be a fantastic concert opener! Available separately: TTBB a cappella and VoiceTrax CD. Performance Time: Approx. 1:00. 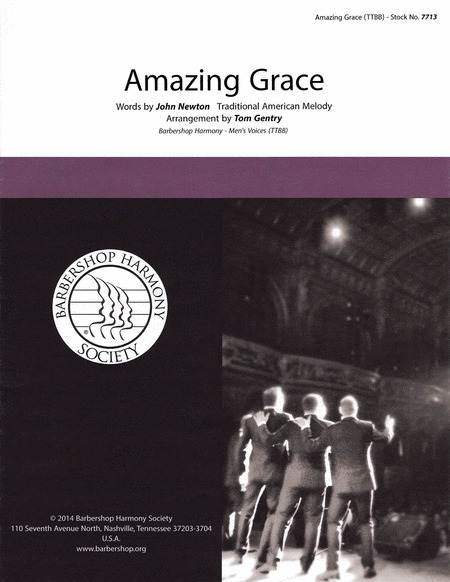 Show the full range of your men's chorus with this favorite spiritual that highlights each voice part until they combine in an audience-pleasing full harmony conclusion. A fantastic concert closer! Available separately: TTBB, VoiceTrax CD. Duration: ca. 2:30. Ricky Nelson's 1960's hit is a natural for the tight harmony found in this well-crafted barbershop version. Available separately: TTBB a cappella and VoiceTrax CD. Performance Time: Approx. 1:50. 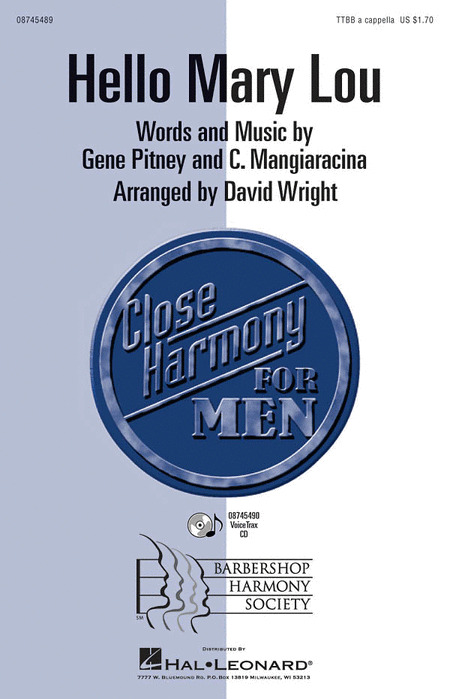 Energize your men's chorus and have fun with some Barbershop harmony! Opening with a gradually building doo-wah introduction, invite your audience to clap along while the lead sings the melody: Hey little baby o' mine, tell me that the sun don't shine, I love you and you love me, that's the way it oughta be. Available separately: TTBB a cappella, VoiceTrax CD. Duration: ca. 2:15. The acoustic folk ballad by popular singer-songwriter Jason Mraz has been arranged by Marshal Webb of the Disney-by-day group Return To Zero. A creative and rewarding arrangement. "I'm Gonna Live Till I Die" is a song Frank Sinatra recorded with Capitol Records and was released in 1955 as a single. The song was sung concert by Sinatra throughout some of his last years. Everyone will have a good time with this feel-good close-harmony arrangement! A fantastic introduction to Barbershop music! Available separately: TTBB, VoiceTrax CD. Duration: ca. 1:40.